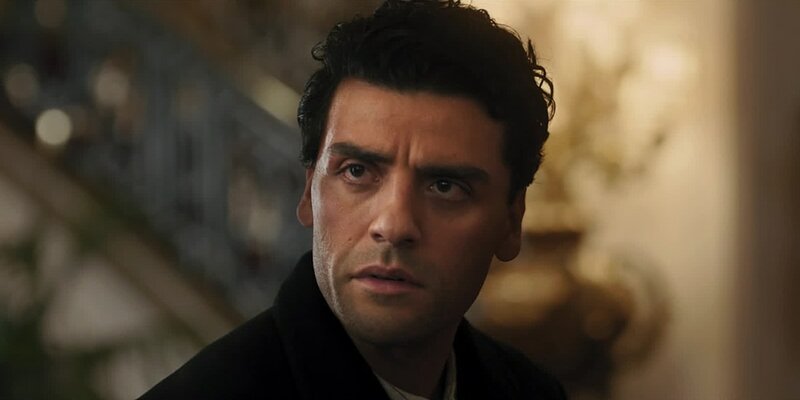 THE STORY - Brilliant medical student Michael (Oscar Isaac) meets beautiful dance instructor Ana (Charlotte Le Bon) in late 1914. Their shared Armenian heritage sparks an attraction that explodes into a romantic rivalry between Michael and Ana's boyfriend (Christian Bale), an American photojournalist who's dedicated to exposing the truth. As the Ottoman Empire crumbles into war-torn chaos, their conflicting passions must be deferred as they join forces to get themselves and their people to safety. THE GOOD - The Armenian Genocide and all of its brutality is portrayed well on screen despite the limitations of its PG-13 rating. The epic film's production values are incredibly high. THE BAD - A sappy, melodramatic triangle derails the entire film due to its clumsy narrative and character development. Despite well-placed intentions and an ambition from writer/director Terry George that is completely admirable, "The Promise" unfortunately crumbles beneath the weight of its own storytelling. The aspects of the real world horrors which befell the Armenian people during this time of war and genocide are well presented. Terry George even manages to pull off some of the same magic he did in a similar epic genocide film "Hotel Rwanda" which also had the tough task of telling its gruesome story of mass murder with a PG-13 rating. However, a forced love triangle between the three main characters never gains any steam, goes in wild directions and in the end, drowns the film overall. Taking place in 1915 in the eastern part of the Ottoman Turkish Empire, Mikael (Oscar Isaac) is a medical student in Constantinople who falls in love with an Armenian woman who once lived in Paris named Ana (Charlotte Le Bon). However, Mikael is promised to another woman, back home at his village while Ana is currently with another man, the American journalist Christopher Myers (Christian Bale). When the Ottoman Empire begins to round up all Armenians for mass slaughter, Mikael, Ana, and Chris must struggle to stay alive and find a way to secure themselves safe passage out of the country and to safety. "The Promise" does not break any new narrative ground. In fact, it commits the same sin as "Pearl Harbor" did by forcing a love story between two men and a woman at the heart of what is captivating enough material on its own. The Armenian genocide and the struggle of one man to survive and save the people he loves is a strong enough story that the character of Christopher Myers is not necessarily needed. That's not to say that Christian Bale is bad in the role. On the contrary, each actor gives a fine performance in the film despite there being no true standout. However, it is how Terry George and co-writer Robin Swicord choose to write each character that is most frustrating of all and ultimately, where they each end up in the end. Both Mikael and Chris are flawed men, making them hard to root for in terms of who should ultimately end up with Ana. Ana is also tough to understand as her allegiance to both men seems to swing back and forth in what seems like a matter of days. By the time the film reaches its third act, I had no idea how Terry George and Robin Swicord were going to resolve this complicated love triangle they had forced upon us. The way in which it concludes is the most disappointing aspect of the film and makes "The Promise" a tough film to ever revisit. This does not mean I do not recommend "The Promise." Contrary to what you may have heard, I do not believe the film suffers from a sense of bad pacing. Bad plotting and character development maybe, but this is certainly not a boring film. In fact, it's a film that most should watch simply because very rarely do we see a dramatization of what happened to the over one million Armenian souls who met their demise at the hands of the Turkish government. The fact that their murders are not acknowledged by the Turkish government to this day, alone makes this essential viewing so that mature younger audience may know the truth. Consider also that “Hotel Rwanda,” Terry George’s last true story genocide film, received a production budget of $17 million and was a truly captivating film in its own right. “The Promise” received $100 million and it shows on screen. With its sweeping cinematography, large scale and various set pieces, “The Promise” certainly feels like it's important and receives the dedication it deserves from director Terry George. Which, makes it so frustrating that the same level of care which he brings to the actor’s performances and production values, could not be brought to the film’s screenplay. “The Promise” is a film that should have been the next “Schindler’s List,” but it cannot even manage to be the next “Hotel Rwanda.” While not as good as that film, it holds more in common with another film by the name of “Pearl Harbor” due to its poorly plotted love story between Mikael, Chris, and Ana. While I won’t venture to say “The Promise” is as bad as that film overall, it still suffers from the same melodramatic narrative problems that plagued Michael Bay’s war/romance. Personally, I would not mind one day seeing a re-cut version of “The Promise” online or by Terry George himself, one that takes out the love triangle bits between the three leads and instead focuses on their plights to survive in the face of incredible odds. Considering the backlash this film is already receiving, I highly doubt another filmmaker will attempt to tell a story on this scale of the Armenian genocide for some time, but I wouldn’t mind it if they tried, as I feel the material is important enough that we need more stories about what happened over 100 years ago, so that the Armenian people’s pain, strength, and history will never be forgotten.